Gaffer for a Day, Steve Reeve, aged 56 from Horndean, gives his opinion on Pompey’s 4-1 triumph over Rochdale. So can Pompey do this? If ever there was a time when focusing on one game at a time is important, that is now. We must really concentrate on each individual fixture, tick them off one at a time, because we can do this. Definitely. Sunderland have dropped five points in a week – and I think they’ll drop more. While following Saturday results we clawed back four goal difference. 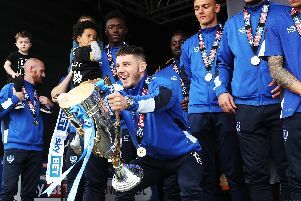 Kenny Jackett should be telling his players that if they want to finish on May 4 rather than May 26, they need to put in extra work over the next three weeks. In my preview I said if we scored early I could see us scoring lots of goals. Thankfully it turned out correct! If we had scored eight, Rochdale could have no complaints, while we were really stupid to allow them to score a consolation and ruin the clean sheet. As it was, though, we could have got plenty more. Oli Hawkins had a few headers in the first half, Lee Brown missed a sitter at the very end and keeper Josh Lillis pulled off a great save to deny Omar Bogle. It remains a concern that we tend to regularly play really deep when a couple up. But, apart from the one defensive error, I don’t think Rochdale looked like having anything from the game. It has got to be Jamal Lowe – or Conor Chaplin! He was outstanding, absolutely outstanding, not only back to the form earlier in the season, but actually better. You look at how he created the space to cross for the first goal. I also didn’t realise how well Hawkins did to glance that in. For Lowe’s goal, he showed tenacity and what a great finish when running away from goal. I don’t believe anything is perfect, otherwise I would have given him a 10 for that display. If we don’t go up, I can’t see Matt Clarke or Lowe being here next year. It will be interesting to see how they can compete at Championship level. That was funny. When that Sunderland match was 4-4, I remember saying to people around me that all it now needed was for Chaplin to score the winner. I looked at my phone and saw he had come on as a substitute – then 30 seconds later the chant started going around! According to my son, Chaplin was trending world wide at one point. Not the hashtag, but his actual name! He’ll be back on Easter Monday with Coventry, but I'd rather he didn’t play. Fans become overly nervous when former players with a point to prove return. It’s always like that with John Marquis.